It seems I’ve read several war-era books lately, but this was a first for me in that the characters weren’t Americans. The story was fascinating to me, and I really enjoyed it. Jack is a complicated guy, and it honestly took me quite a bit of the book to really get a feel for his character. Our first impression of him is one of anger, and our second impression isn’t much better. He suffers a horrible tragedy between the first and second mention of him in the book, and that tragedy fully defines the character that he is. I was over half was through the book before I began to have any good feelings for his character. But once he became a more positive character, I really fell in love with him. He was determined and persistent, and I loved the person that he turned out to be. Grace is one of those girls that goes all-in when she makes her mind up to do something. I have that same trait, so I felt like I could completely relate to her. This book starts out with her doing something completely bold and frowned-upon. This gave me a not-so-great first impression of her, but within a few chapters we see her as a completely different character. When Grace decides she wants to do something to help the war, she goes in fully ready to sacrifice whatever it takes. I also saw her as a girl with a huge heart, and her determination to make Jack a better person made her a character that tugged at my heart strings. It’s hard to talk too much about this book without giving away the plot line, but it is a book of persistence and it will leave you with that good-feeling in your heart. A great story. A Florida girl and former bookseller, Kate Breslin migrated to the Pacific Northwest where she lives with her husband and a spoiled cat named Coco. Kate has written travel articles, published award-winning poetry, and was a finalist in RWA's Golden Heart Contest. FOR SUCH A TIME is her debut novel; now that she's writing inspirational romance, Kate enjoys creating stories showing how God's love brings two hearts together. When she's not plotting the next novel, Kate can be found with her nose in a book, or enjoying a long walk in one of Washington's beautiful forests. She also likes to do a bit of traveling to new places--great for finding the next story idea! She'd love to hear from you, so please stop by and say hello at www.katebreslin.com. Running from a past that haunts her, Abby Knightly is drawn to the homey town of Wishing Springs, Texas, after her favorite advice columnist found love and a home there. Maybe this small town could offer hope and healing and a future for Abby too . . . if she's brave enough to reach out and take it. Bo Monahan isn't interested in the new romantic destination his little town has become--or the women who might be looking at him like he's their next Mr. Right. Between taking care of his Pops and his growing stirrup business, he isn't looking for serious romantic commitments. But unexpectedly the young child he never knew about appears on his doorstep and Bo's world is turned upside down. This confirmed bachelor might not need a wife, but he sure needs a woman . . . and newcomer Abby Knightly is definitely a woman. When she comes to his rescue to help him navigate fatherhood, he slowly uncovers her own history. And suddenly Bo's thinking maybe, just maybe, together they can help each other work through the problems of the past to create a future of their own. 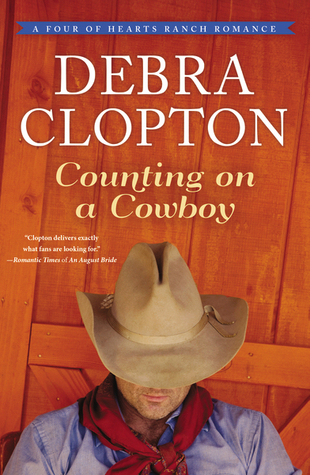 Since the day I met the Monahan brothers in Betting on Hope, I have been eagerly awaiting this next installment in the Four of Hearts Ranch series. I was excited to read more from this town and this family, and I was not disappointed. As we get to know Bo, we realize that he is a hard-working and kind-hearted cowboy, much like his brothers. We get to see a little of his giving personality come out when he meets Abby, but when his son appears in this story we really get a true sense of who Bo is. I was blown away by his determination to care for his son, but also the ways in which he truly fought for his relationship with Abby. His relationship with his grandfather touched my heart in so many ways, and I just wanted to reach out and give the guy a hug through most of this book. When we first meet Abby, I initially judged her as a little bit ditsy. But I figured out very quickly that it was a wrong assessment. Abby has been through more in her short life than most people could handle. She is a determined woman who is fighting to get her life back together and try to start over. I absolutely fell in love with her character, and also found myself crying with her through some parts of this book. She is resilient, and I wanted nothing less than a perfect ending for her story. Of course, this book comes complete with all the characters and landmarks that make Wishing Springs a place we all want to live in. We get a little more insight into some of the townspeople in this book, and I really enjoyed that aspect of the story as well. The third book in this series, Kissed by a Cowboy, is releasing this year, and I can’t wait to get my hands on it. “I’d never been late for anything. I just knew this would be a bad day.” When Penelope oversleeps, her daily routine gets thrown for a loop. From wearing mismatched socks to receiving her first-ever “B,” will “Penelope Perfect” survive this imperfect day? This encouraging story told in cheerful rhyme will speak to kids who deal with perfectionism or other forms of anxiety. The book concludes with tips and information to help parents, teachers, counselors, and other adults foster dialogue with children about overcoming perfectionism and coping when things don’t go according to plan. Such a fun book for elementary kids! Ting has a tendency to get into a routine, and things get a little crazy around her if that routine gets out of whack. Thankfully she has gotten much more laid back in recent years, but we can still relate to this story of Penelope and her routine of perfection. Penelope strives to be the perfect kid, and she is stuck in a routine. She wakes at the same time, eats the same breakfast, skips recess to tidy her notes, and is meticulous to do her homework until bedtime. She perfects each and every detail of her life. Until… she oversleeps! The day that Penelope oversleeps becomes a day of laid back fun. She discovers an entire world outside her routine, and she discovers that she doesn’t have to be perfect all the time. What a great lesson for children to learn. They don’t have to be perfect, and it’s okay to have fun and be a kid. This book is also filled with some great illustrations – bold colors with a fun style. The end of the book also has activities and discussion ideas that can be used with kids both at home and in the classroom. It's Literary Junkies day! Summer is winding down and fall is on the horizon. Scroll down to see what I've got going on these days, and then head over to Pink Heels Pink Truck and Life With a Side of Coffee to catch up on all things bookish. What are you reading right now? At the time of writing this, I'm in the middle of In Firefly Valley from Amanda Cabot. It's the second in her Texas Crossroads series. The series takes place in the Texas Hill Country in a teeny tiny down. In the first book we were introduced to the run-down Rainbow Resort, and watched Greg and Kate fall in love and purchase the resort. In this second book we are getting to know Marisa, a hometown girl who has reluctantly moved back to her hometown and taken the job as business manager at the resort. She's not too thrilled to be back to small-town life, but things are beginning to heat up between her and one of the guests. What books do you have on request at the library? None! I'm thankful to have a full schedule of book tours and sponsored reviews on the calendar and haven't had much time to head to the library lately. Do you prefer to read one book at a time, or several at once? I'm a one book kind of girl. If I try to read more than one book I start getting the characters and story lines mixed up. I read a book, and then have to write my review before I start the next one, or else the entire review turns into a hot mess! What makes you love a book? Great characters in a charming town. You get some down-to-earth characters and put them in small-town-America and I'm hooked every time. I can almost tolerate a horrible plot as long as the characters are fun and the town is appealing. It's weird, I know. Fall is just around the corner... what is your favorite cookbook? Oh, throw a hard one at me! I have several cookbooks on a shelf, but I rarely pick any of them up. I'm more of a Pinterest girl when it comes to scouting out new recipes. Irish immigrant James O’Leary has spent his life building Irish Meadows into a thriving horse farm and is not about to let hard economic times threaten its success. 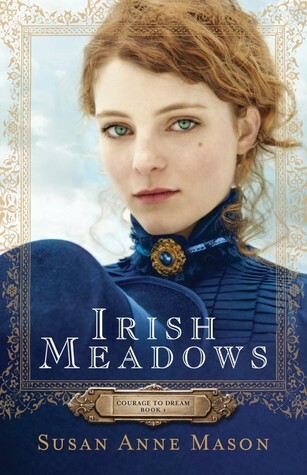 He intends for his daughters to marry prosperous men–ones who will secure the family’s rightful place in society, and at the same time, guarantee the future of Irish Meadows. Both girls, however, have different visions for their futures. Brianna and Colleen O’Leary know their father expects them to marry well. Yet despite his wishes, Brianna, the quieter sister, dreams of attending college. 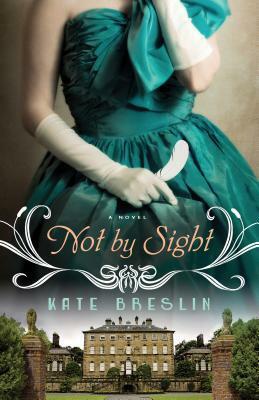 Vivacious Colleen, meanwhile, is happy to marry–as long as her father’s choice meets her exacting standards. When stable hand Gilbert Whelan returns from college and distant family member Rylan Montgomery stops in on his way to the seminary in Boston, the two men quickly complicate everyone’s plans. It will take every ounce of courage for both sisters to follow their hearts. And even if they do, will they inevitably find their dreams too distant to reach? This is one of those books that really grated on my nerves at times, but when it was over I realized it was actually a very good story. I can’t imagine living in a time when fathers had so much say in who their daughters married. Love and friendship, and all that goes with a good marriage, was usually way at the bottom of the list of traits that a man must possess to marry one’s daughter. Colleen and Brianne both lived under their father’s control, and he turned out to be a bully who was only out for his own gain. He wheeled and dealed with his own interest in mind, and never once considered if his daughters would be happy with the men he chose for them to marry. I spent most of this book wishing I could just read through the pages and shake some sense into these two girls, and to tell them to follow their hearts and not to worry about their dad. But again. I didn’t live in that time period when this way of thinking was perfectly acceptable. Gil and Rylan are very similar in their character traits. Both have high morals and ethics, and simply do what their mind has convinced them is the “right” thing. Neither of them is willing to give into their hearts’ demands for fear it will upset their parents. Throughout most of this book it was apparent that someone was going to fall in love, but both of these male characters spent so much time messing up that I wasn’t sure it was ever going to happen. This story took a huge turn when near-tragedy struck. And as it is with tragedy, people tend to change their way of thinking and their ways of doing things. Once everyone finally admitted their true desires and feelings about their own lives, this book was so entertaining. When it was over, I found myself missing these characters and wanting to know the rest of their stories. I’m looking forward to the next book in this series – coming in early 2016. Susan Anne Mason always loved to write. As a teen, she wrote my first novel, only to be politely rejected by her publisher of choice. Life got in the way - university, marriage and children became the priority. Then once she had time to start reading again, the writing bug bit once more. She enjoys writing both contemporary and historical Inspirational romances. 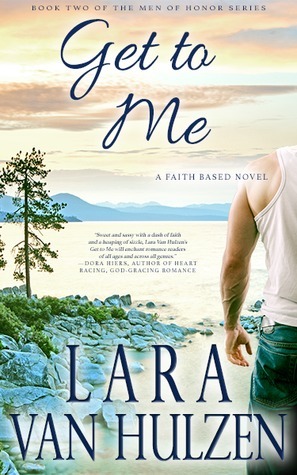 "Romance sprinkled with faith" describes her writing style. She loves themes of forgiveness and redemption! 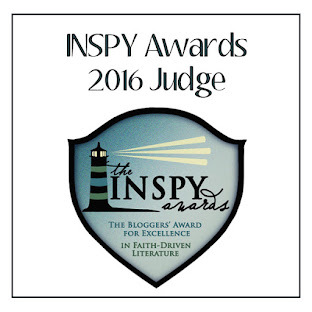 She is a member of the American Christian Fiction Writers (ACFW) and the Romance Writers of America. Her association with such amazing groups of people has been the biggest asset toward learning her craft. Home for Susan Anne is Brampton, Ontario, Canada (near Toronto), where she lives with her husband, their two children and two cats. Her day job is a part-time secretary at a local church. In her spare time, she likes to read and research her family history on-line. When you pray, does it ever feel like you’re just saying the same old things about the same old things? 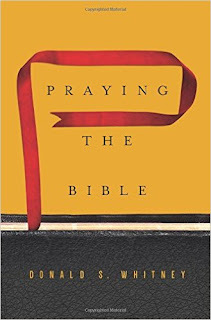 In Praying the Bible, best-selling author of Spiritual Disciplines for the Christian Life, Donald S. Whitney, offers the encouragement and the practical advice we’re all looking for to transform our prayer life. Simple, yet profound, this book will prove invaluable as you seek to commune with your heavenly Father in prayer each and every day. Wow! That pretty much sums up my thoughts on this book. I learned to pray as a child. I was taught the basic bullet points that should be included in a prayer, and was basically told the order in which I should address those bullet points. Although the content of my prayers have changed over the years, I find that I still hold tight to that same structure that I used as a child. Whether intentionally or not, I have taught my kids to pray in that same structure. We say our prayers each night and they are almost rehearsed as far as the kids go. I’ve never really thought much about it until I got this book in my hands. In Praying the Bible, I learned a completely different concept for prayer – and I love it. 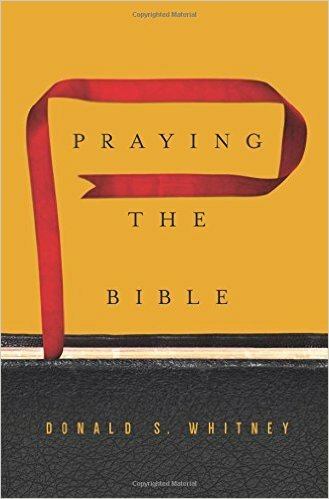 The concept of this book is that you pick up your Bible, start reading, and then pray whatever comes to mind. Wow! God wants us to have a friendly conversation with Him. Tell Him everything and listen to what He has to say. But when you get into the prayer rut that so many of us use, it is hard to imagine doing something different. But I love the ideas in this book and I have enjoyed giving it a try. I admit it was a little hard to wrap my mind around praying whatever came to mind, but it is getting easier and I feel like my prayers come much more naturally these days. I have been blessed by this book, and I am so thankful for Family Christian for giving me the opportunity to have it in my hands. And I’m really excited because Family Christian wants to give one of you a copy too. Just use the widget below to get entered. Entries close at 6pm CST on Wednesday, August 26. Now available in the popular board book format, a fun bedtime story that retells the familiar Noah’s Ark classic Bible story. 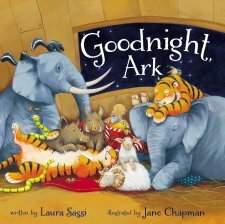 Goodnight, Ark tells the story of Noah and the animals as they try to sleep through the storm that is raging outside. But when the storm gets louder, boars, quails, elephants, snakes and a few other furry friends join Noah in bed, creating quite the commotion! 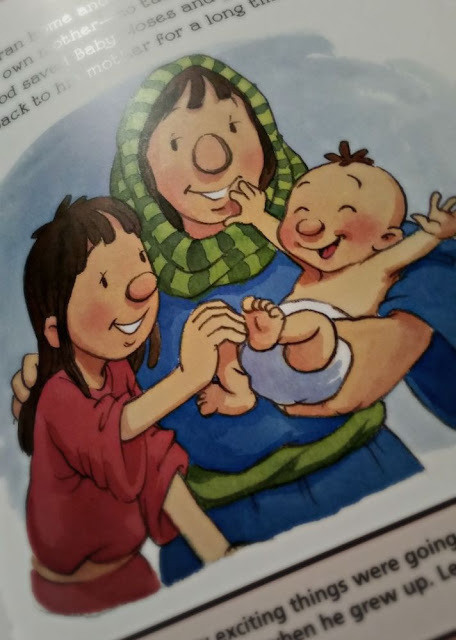 Author Laura Sassi brings a humorous new dimension to one of the Bible’s most popular stories, giving a delightful glimpse into the emotional bond between Noah and the animals in his care. With sleek, buoyant verse and eye-catching illustrations by Bear Snores On illustrator Jane Chapman, this read-aloud bedtime tale is sure to become a favorite of children and parents alike. Most of us know the story of Noah and the Ark, but this book takes a fun spin on it and makes it a ton of laughs for both of my kids. Ting thought the story of all the animals getting in bed with Noah was so hilarious. She laughed through the entire story, and then took the book and read it many times herself. The sing-song rhyme of the story made it easy for Bug to follow along, and he absolutely loved the illustrations. All the animals piled high in Noah’s bed makes for a pretty funny picture. Since both of my kids are pretty leery of storms, this book also becomes a story they can easily relate to. Only I hope they don’t come jump in my bed next time it thunders, haha! Of course, all the animals eventually fall asleep and we are able to tell everyone – including my kids – goodnight at the end of the story. This has become a fun bedtime story for our family. A great addition to any kids’ library. One case from her past defines homicide detective Abby Hart. With a possible serial killer stalking elderly women in Long Beach, California, Abby's best lead is Luke Murphy, an irritating private investigator who saw a suspect flee the scene of the latest homicide. When Abby discovers that the most recent victim is related to the governor, she's anxious to talk to him about a cold case that's personal to her--one Luke is interested in as well. 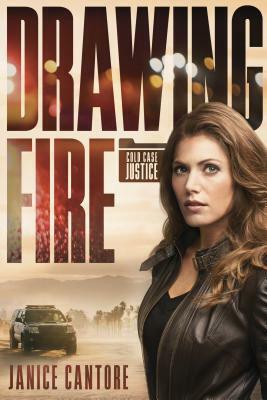 As she learns more about the restaurant fire that took her parents' lives years ago, Abby discovers why Luke is so invested in finding the ones responsible. The more they uncover, though, the more questions they have. Can Abby find peace without having all the answers? I stayed up way past my bedtime two night in a row to read this book - and it was worth every minute of lost sleep! It's been a while since I got into a book and enjoyed it this much. These characters were so complex, yet so easy to get to know and feel like you were friends with them. From the opening chapter of this book there is suspense and tension. Abby and her team are determined to solve a couple recent murders, yet Abby wants nothing more than to find out what happened to her parents. Luke simply wants to know what happened at the restaurant, but things are so tense between him and Abby. As the two of them discover they are secretly working on the same case, things really begin to move quickly and this book becomes one of those stories that you simply cannot put down. I kept telling myself "one more chapter", but then I would just have to keep going. I was a tiny bit disappointed that when this book ended I felt like I had some questions that didn't get answered. But... I contacted Janice to find out about the upcoming books in this series and she assured me that these characters' stories would continue. So I'm good with that. Drawing Fire is a must-read for your reading list, and its follow-up Burning Proof will be out in early 2016. Aimee can identify a killer. Dane can keep her safe. But is he willing to face his past to do it? When Aimee Jansenn stumbles upon a drug deal gone bad she comes face to face with a killer. As the only witness to a crime, she falls into a deadly situation and is in need of police protection. Dane Scott has sworn off women. Until a fireball named Aimee enters his world. Telling himself they’re just friends, he vows to protect her. Can his heart follow suit or will she change his mind about love for good? It's been a while since I read a really good suspense thriller with the perfect mix of romance, but this book has it all. Both Aimee and Dane have qualities that make them great characters. Each of them has a background that makes the twists and turns of this book so much more intense. As Aimee find herself in danger, Dane is the perfect man to come along and be her knight in shining armor. The way he just sweeps in and protects her is so sweet and attractive, but every time he gets close he pulls away. Watching these two dance around each other while trying to keep Aimee safe made this book so enjoyable. This book does have a few words that you don't typically see in the Christian genre, but they are minimal compared to what you probably hear from your favorite TV show. And that moment when Dane and Aimee both find themselves turning to God to work everything out makes this a true love story. I thought this was a great book and definitely worth the read. Lara Van Hulzen received her BA in Journalism from Point Loma Nazarene Universtity in 1994. Her first published article was when she was a senior in high school. She has worked as a book reviewer for the past 18 years with various organizations such as Crossings Doubleday, YouthWorker Journal, and www.radiantlit.com. She is a member of Romance Writers of Americaas well as Inspire Christian Writers andAmerican Christian Fiction Writers. She lives with her husband and three children in Northern California. A special thanks to the folks at Tommy Nelson for sponsoring this giveaway. My kids love getting books from them each month, and I love getting to share them with you! Noah built a big boat and David took down a giant. Beautiful Queen Esther saved her people. Jesus healed a sick boy and stopped a storm! What will happen next? 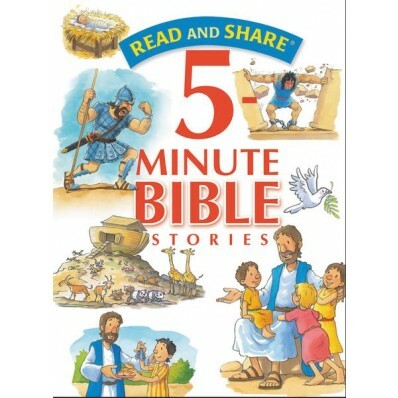 Ninety exciting adventures will capture your little ones’ hearts and minds in Read and Share 5-Minute Bible Stories. Perfect for reading aloud in about five minutes, these stories from both the Old and New Testament are told in kid-friendly language. Plus, closing questions and thoughts for discussion help parents guide toddlers’ and preschoolers’ understanding—and keep them looking forward to the next story time. In just a few minutes, you can help your precious children discover the wonder of God’s Word! I am determined to make books a part of my kids' lives. It gets hard when life get so busy, and I'm the first to admit I'm not very good about regular story time. But with the new school year approaching, it's time for new routines. Ting can read to herself now (yippie), but Bug still needs Mommy for story time. But his attention span is pretty short, and he mostly just wants fun pictures to look at. Thankfully, the Read and Share 5 Minute Bible Stories has become the perfect bedtime book for us. This book is full of all those Bible stories that you remember as a kid - plus some you have probably long forgotten about. The stories are told in very quick segments (think 10 sentences or less), and are spread on two pages. Each page has really fun illustrations to go along with the story. Bug is pretty content to just sit around looking at the pictures and making up his own stories. 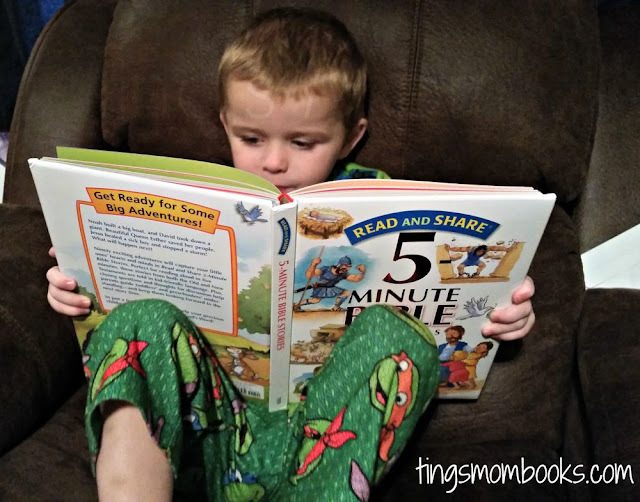 But when bedtime does roll around, we are able to read a story and talk about it (and the pictures) in five minutes or less. 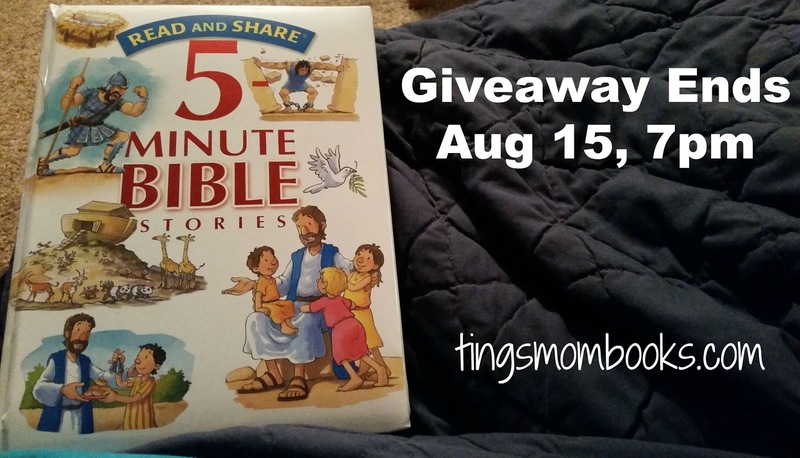 The Read and Share 5 Minute Bible Stories has become a favorite at our house, and I'm excited to give one of my readers their very own copy. Just use the widget below to get entered. A winner will be selected at 7:00 CST on Saturday, August 15. So get entered, and be sure to share this giveaway with your friends. Good Luck! It is 1941 and America teeters on the brink of war. Outgoing naval officer Ensign Jim Avery escorts British convoys across the North Atlantic in a brand-new destroyer, the USS Atwood. Back on shore, Boston Navy Yard secretary Mary Stirling does her work quietly and efficiently, happy to be out of the limelight. Yet, despite her reserved nature, she never could back down from a challenge. When evidence of sabotage on the Atwood is found, Jim and Mary must work together to uncover the culprit. A bewildering maze of suspects emerges, and Mary is dismayed to find that even someone close to her is under suspicion. With the increasing pressure, Jim and Mary find that many new challenges--and dangers--await them. World War II is not a time period that I usually read. Because of that, this book started really slow to me. I simply wasn't used to the time period that was involved. However, once things got going it was hard to put this one down. This book has two or three different story lines going on. There is a friendship between Jim and Mary that seems to be turning into a romance during much of the book. There is the mystery of trying to figure out who is sabotaging the navy yard. And then there is the story of survival when Jim and his crew are out to sea during their missions. Jim and Mary are both fun characters for me. They were friends in high school, but never really talked to each other. Their meeting in Boston was by chance and they seemed to instantly be connected to each other. I loved their fun lifestyle and the way they explored the city and all the historical points that came up. They both are people who are willing to put others ahead of themselves, no matter the outcome, and this trait in the two of them really made me want the best for them. Although the war is not a time period I typically read, I do enjoy learning about the details of the war. Because of that, the story line of Jim and his crew was completely fascinating to me. Getting insight to how they trained and how they all worked together was amazing. When tragedy struck, Jim won my heart by the actions he took for the crew. Overall, this is a great book. This is the first book in a new series from Sarah Sundin, and I will be putting the remainder on my list for sure. Go check it out! 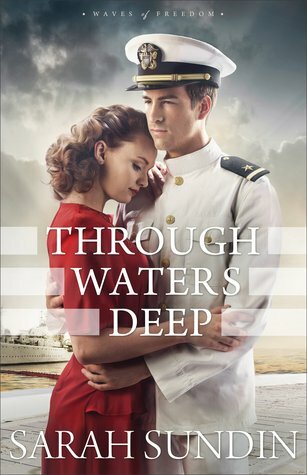 Sarah Sundin enjoys writing about the drama and romance of the World War II era. She is the author of the upcoming Waves of Freedom series (Through Waters Deep, coming August 2015), the Wings of the Nightingale series (With Every Letter, 2012, On Distant Shores, 2013, and In Perfect Time, 2014), and the Wings of Glory series (A Distant Melody, A Memory Between Us, and Blue Skies Tomorrow). She also has a novella in the WWII Christmas collection Where Treetops Glisten (WaterBrook, 2014). Wedding photography is Maggie's passion. The art of capturing a moment forever in time is magical to her, and she's worked hard to become the best of the best. Week after week, she works with couples as they plan their happily ever afters, but she hasn't been so lucky in love. Behind the camera, it's easy to hide from the pain and rejection of her past. 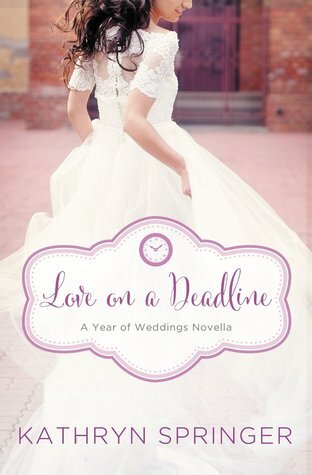 The life she has made for herself is safe and predictable, until the owner of a rival photography studio sets up shop in her small town and comes to her with an unexpected proposal. Suddenly, everything she has worked so hard to build is threatened and her simple, controlled life is thrown into chaos. As she travels the state of Michigan photographing weddings, she struggles to keep her business afloat and the wall around her heart intact. But along the way, she learns more about loyalty and love than she ever imagined. Krista has a different writing style than I am used to, but I found pretty quickly that I really loved it. This story is told through the experience of each event that Maggie is photographing, and it really made the entire book flow in such a perfect way. I fell in love with Maggie almost immediately, and really wanted to reach out and give her a hug throughout most of this book. She's a girl with a complex background, carrying around a lot of baggage. It can get tough living that life, and I cheered for her through this entire book. Simon drove me crazy throughout most of this book. He was such a persistent jerk! I spent half the book hoping he would win Maggie over, and the other half wishing he would just go away for good. My struggle with how I felt about him was completely reflected in Maggie's character and I think that is why I liked her so much. This story took an unexpected turn for me towards the end, but I really liked how it all came together and ended up. I thought it was the perfect ending for all the characters involved. 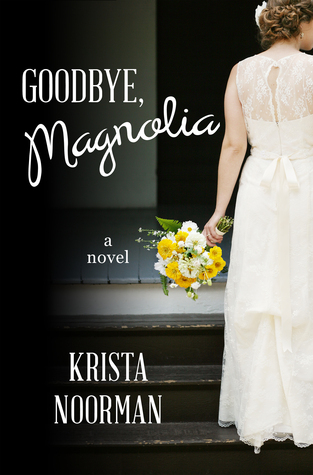 Krista Noorman is the author of the young adult novel, The Truth About Drew , and the contemporary romance, Goodbye, Magnolia . Most of her life has been spent scribbling away in journals, honing her writing skills, while documenting her every day life. But it wasn't until she took part in National Novel Writing Month that she found her true calling and turned her pen (or rather her computer keyboard) to fiction. Krista studied music education at Cornerstone University. After college, she turned to her love of photography and spent nearly a decade running her own wedding photography business. She is constantly inspired by books and movies, enjoys beautiful instagram feeds, and loves a great cup of coffee. Krista makes her home in a small town in western Michigan with her husband, Jacob, and their two children. She writes about life, family, faith and whatever else comes to mind at bykrista.com . Err... I didn't like this one, y'all. I hate to say that because I have loved this series so much (and I really like Kathryn Springer), but this just didn't do it for me. I felt like this story was completely predictable from the very first chapter. As soon as we met these characters I had had them all figured out and knew where they were all going to be when this was over with. I never felt a real connection to any of the characters, and I felt they all fell a little flat for me. I wanted to love every story in the Year of Weddings 2 series, but it just didn't happen. It's hard to believe but summer is pretty much over, and school is about to start. We've purchased supplies and ordered uniforms, and now we are pretty much in back-to-school mode all around. Bug is three years old and will be back in preschool this year. One of the things I really want to focus on with him this year is letter recognition and phonetics. I also want to make a better effort to read with him. I obviously love to read, and I desperately want to pass that love on to my children. Today I'm teaming up with Sourcebooks to bring you some great book suggestions for your preschooler as you head into this new school year. And be sure to read all the way to to bottom because there's a great giveaway as well! Ten little mice search for the perfect gift to give their teacher! Tomorrow is Ms. Tulip's birthday and a celebration is in order! But how will her ten students decide on the right present? Luckily ten minds are better than one when choosing the ideal gift for the very best teacher. Ye Shil Kim is the author of numerous picture books in Korea. She works as an illustrator agent for EenArt in Korea. MIKU MORIUCHI graduated with a BA in illustration from the Norwich School of Art and Design, and an MA in illustration from Brighton University. She has illustrated 21 picture books, and lives in London. Tomorrow is a very exciting day--it’s Elmo’s first day of school! And Elmo needs your help to get ready. Let’s go off to school! 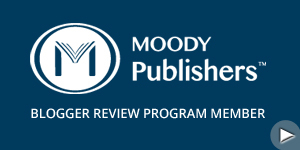 By: Ellen Honeck, Ph.D, Nancy B. Hertzog, Ph.D, and Barbara Dullagan, M.Ed. The Smart Start series fosters engaging conversations for parents and their children through the use of interactive questioning. Images in these books convey children in realistic and familiar stages of play, and each image’s corresponding questions prompt children to think at critical, creative, and mathematical levels about their everyday surroundings and activities. The open-ended questions stimulate curiosity and invigorate conversations between parents and children. The books in this series highlight the vast world of a child’s imagination and encourage children to think deeply about the objects and situations they’re faced with every day. The first book in the Smart Start series for pre-readers fosters engaging conversations for parents and children through the use of interactive questioning. Images in this book convey realistic and familiar settings around the house: in the kitchen, the playroom, the bedroom, the garage, and more. The second book in the Smart Start series. Images in this book convey children in stages of play, and each image’s corresponding questions prompt children to think at critical, creative, and mathematical levels about their everyday surrounding and activities. The third book in the Smart Start series. Images in this book convey children and parents in a familiar shared experience: going to and exploring the market. Nancy B. Hertzog, Ph.D, is a professor of educational psychology at the University of Washington and the director of the Halbert and Nancy Robinson Center for Young Scholars. She is the author of two books, Ready for Preschool, andEarly Childhood Gifted Education. Barbara Dullaghan, M.Ed., is currently Elementary Gifted and Talented Coordinator for Bloomington Public Schools in Minnesota.